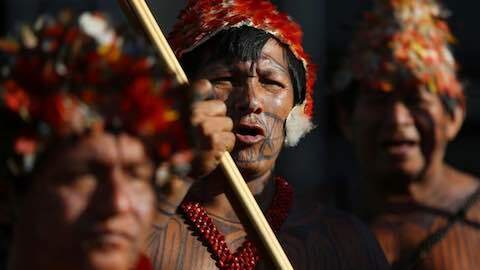 Facing Pressure From Agricultural Interests, Brazil Has Stopped Formally Demarcating Land For Indigenous Communities In A Threat To Rainforest Conservation Efforts, According To A Former Senior Government Agency Official And Campaigners. Brazil's Constitution Recognizes The Right Of Indigenous People To Live On Their Ancestral Lands And The National Indian Foundation (Funai), A Government Body, Has Been Working To Demarcate Land For Tribes, Who Make Up Less Than 1 Percent Of The Population. But New Lands Have Not Been Demarcated For Indigenous Groups Since August Amid A Push By Lawmakers From Brazil's Rural Areas To Change The Process, Said Former Funai President Marcio Santilli In Comments Echoed By Campaigners. "There Have Been No Positive Actions To Move Forward With Pending Demarcations," Said Santilli, Who Led Funai In The Mid-1990S And Now Advises The Instituto Socioambiental, A Brazilian Environmental Group. "The Bancada Ruralista (A Group Of Rural Politicians)... Is Proposing Constitutional Amendments To Weaken The Territorial Rights Of The Indigenous," He Told The Thomson Reuters Foundation. Funai Officials Said They Could Not Immediately Comment. Home To The World's Largest Tropical Forest, Brazil Has Lost About One Fifth Of The Amazon Rainforest In The Last 50 Years, According To The World Wildlife Fund. Research By The U.S.-Based World Resources Institute Shows That Deforestation Rates On Land Formally Owned By Indigenous Peoples Are About 2.5 Times Lower Than Other Areas Since They Are More Likely To Conserve The Forest Than Other Users. But Politicians Representing Rural Voters Oppose Demarcating New Territories For Indigenous Groups, Saying The Land Should Be Used For Farming Or Cattle Ranching To Boost Economic Growth In The Recession-Hit Country. Santilli Said Rural Politicians Were Proposing New Steps To The Demarcation Process Which Would Make It "Virtually Endless". He Also Said They Were Also Proposing That Congress, Rather Than Funai Or The Justice Ministry, Make Decisions On Which Lands Are Demarcated To Indigenous Groups. About 13 Percent Of Brazil's Territory Has Been Set Aside For 900,000 Indigenous People Based On Lands They Historically Occupied. This Is Spread Across 700 Parcels Of Territory Including More Than 450 Which Have Been Formally Demarcated. Santilli Said Budget Cuts To Funai Had Also Affected Its Demarcation Work. Latin America: "Brazil Stops Demarcating Land"